A service encounter happens any time a consumer interacts with a servicing organization. Every website hit or incoming ad or sign call is a service encounter. When a prospect talks to you, your staff, your company receptionist, your closing coordinator, or your broker, owner, lender, escrow or title attorney, or anyone on your service team, that person is having a service encounter. If one person in the long chain of people who help you get your job done says or does anything negative, it affects the impression of the nature of the service you provide. There’s no way to separate yourself from your colleagues if they mess up. It’s even possible for your service to be tainted by those outside your service team. For example, say that a buyer uses a lender other than the one you recommend. If the transaction closes late and with a higher interest rate than originally quoted, that client will leave with a bad impression about the whole transaction and everyone involved in it. Your future business and referral opportunities are affected by the actions of someone entirely outside your influence. Control service encounters by using your own people to conduct transactions. Direct and drive as much business as possible to the best providers. Work hard to convince the client to use people on your team when securing a mortgage or closing the deal. Some may call this “steering,” but I view it as taking care of your clients. Make sure your clients work with lenders who know their stuff and are responsive. Be aware that the lender triggers the choke point in most transactions. Take time to counsel your clients toward a resource you know will perform. Find out from the client what it will take to turn the unsatisfactory situation into a satisfactory outcome. Ask what it will take for them to be delighted. Be cautious here. I don’t really believe that forgoing a fee or reducing a cost ever creates a more satisfied client. The service and the cost are not linked at this stage of customer satisfaction. Follow up. Eventually sore feelings will wane, but the only way to replace the negative impression is to make a better one through continuous, professional contact. In the early stages after the mishap you may not see many referrals, but when they start to come through you’ll know your service recovery plan was a success. Will offering cash really turn this client into a raving fan? Is there another way to turn this client into a raving fan? Is there a reasonable chance that I’ll win future business and referrals from this person? 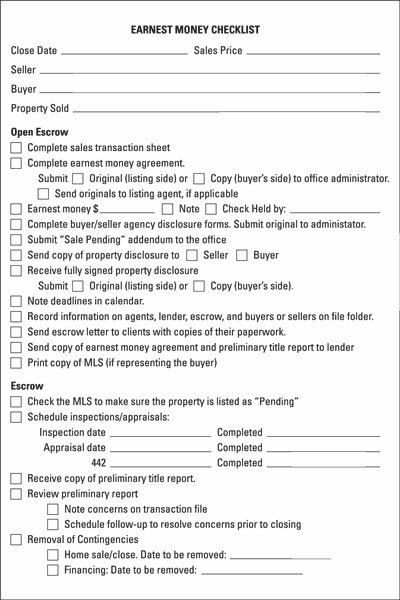 The best way to provide the level of service you and your client agree upon is to create two checklists, a New Listing Checklist that details the steps you will follow when accepting a listing and a Sale Agreement Checklist that details all the steps that happen from contract to close. The following figures present samples of each of these checklists to guide you as you develop forms that work for your own business. Standard procedures vary from state to state and MLS board to MLS board. You need to customize them to fit the requirements of your state, region, municipality, and code of ethics. 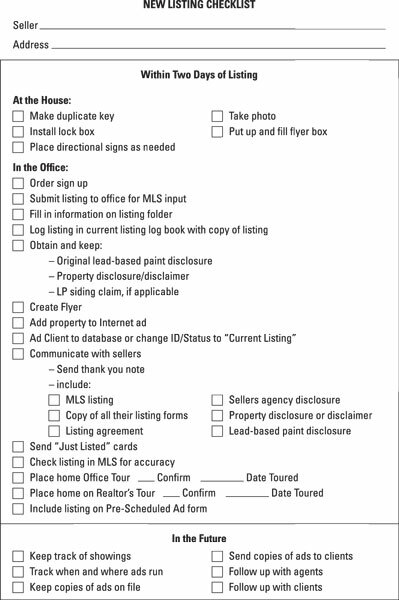 Customize this checklist to reflect the steps you follow when acquiring a new listing. 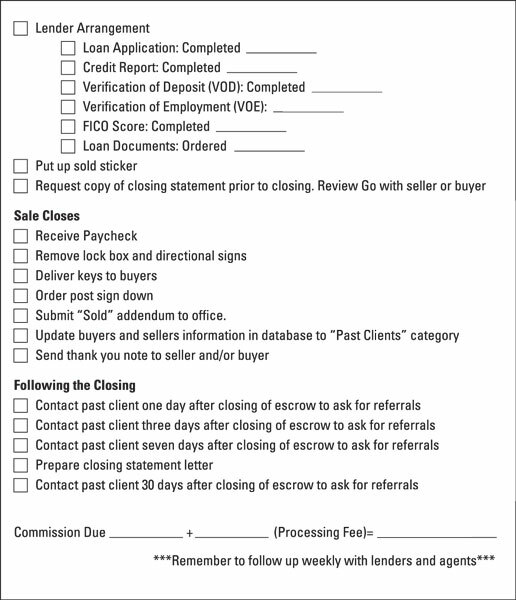 Customize this checklist to reflect the steps you follow from contract . . .
. . . to closing. Right after closing, arrange for two hours of complimentary handyman repair work. The cost of this much-appreciated added value is only about $100, and the perceived value is huge. More often than not, clients use more time than the amount covered by your gift, so the handyman acquires new clients and as a result will probably give you a great deal on the time he sells to you. Also, by sending in a handyman, you help the clients resolve small issues the seller didn’t handle before they fester into something bigger that leads to frustration with the transaction, which leads to frustration with you. This idea is an inexpensive win/win. Shortly before each event date, invite clients to attend the event with you. Don’t issue invitations when you first buy the tickets. Wait until a few days or a week before each event. At that point, your invitation will seem spontaneous and genuinely friendly. Some of your invitees will already be booked and will have to decline. You may have to call six to ten people to give the tickets away. If so, you’ll win their appreciation, and you’ll still have the tickets to share with another long-term client.